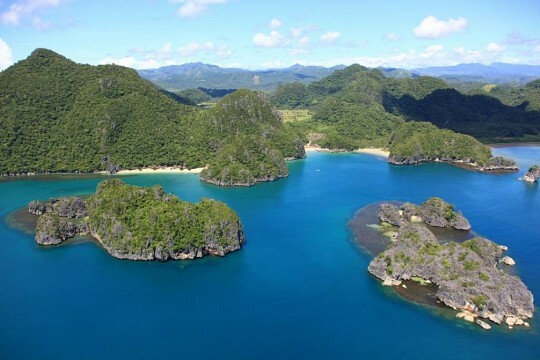 More specifically, Caramoan as a municipality has its islets to thank for the said exposure. 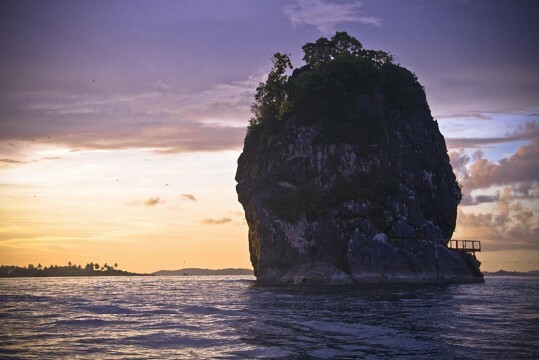 These islets have become collectively known as the Caramoan Islands. Before the Spaniards step foot in the area, the Caramoan Islands had been determined to be frequented by Dutch traders who did business with the locals. These people were also said to have operated a gold mine in one of the islands, namely Lahuy. The area was then called Guta de Leche after the milk drop stalagmites near Guta Port. When the Spaniards came along, there was a visible population of sea turtles which then led to the place being called Carahan. In 1619 another group of Spaniards arrived and that was when Caramoan became the official name for the municipality and the group of islands off its coast. In March 2012, the Caramoan Islands became the location for Survivor: Philippines, the 25th season for the American hit reality TV competition. This leg was then followed by Survivor: Caramoan which was shot in May of the same year. Since then, the Caramoan Islands have also been the shoot location for many other seasons from the Survivor franchise. 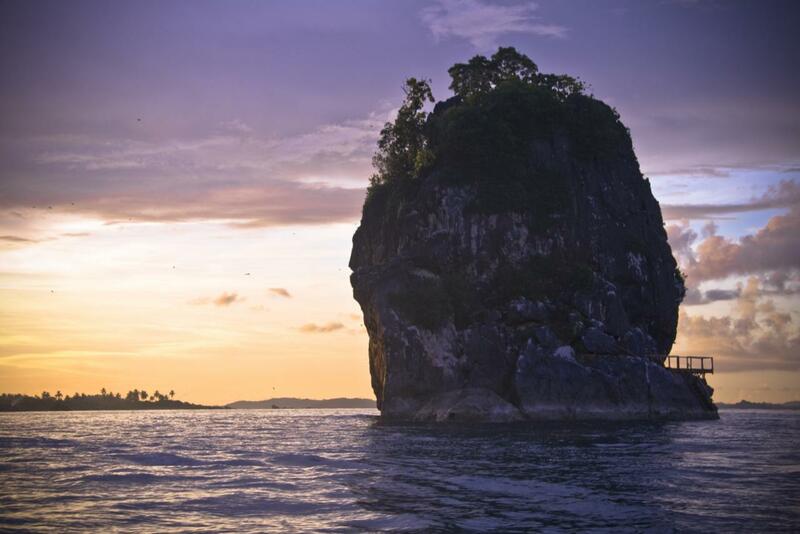 About 15 islets comprise the Caramoan Islands. There are real islands which are rich with limestone deposits and trees and basically don’t disappear when the tide is high. There are also sandbars which are still considered in the count of islands though they obviously can’t be found when the tide engulfs them for the day. The whole municipality itself is on the Pacific coast of the Philippines and is frequented by typhoons passing through the country. Although the island of Catanduanes lies west of Caramoan, it is not enough to block the winds and waves from devastating the latter during strong storm signals. 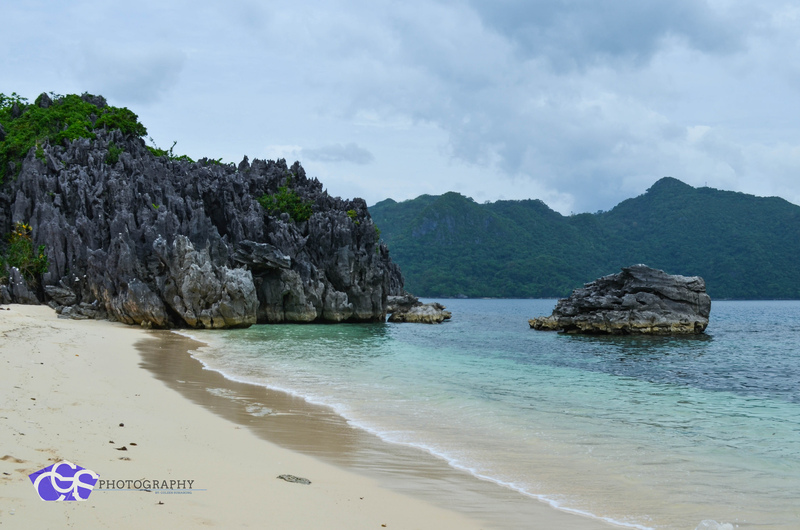 The most popular activity when in Caramoan is island hopping. Visit a number of the Caramoan Islands and enjoy a dip in the blue waters, soak in the sun while napping on a sandbar, or have lunch at a floating cabana and feast on freshly prepared local dishes. At each, expect to enjoy either powdery sand beaches or walls of limestone teasing you to go on an impromptu trek. 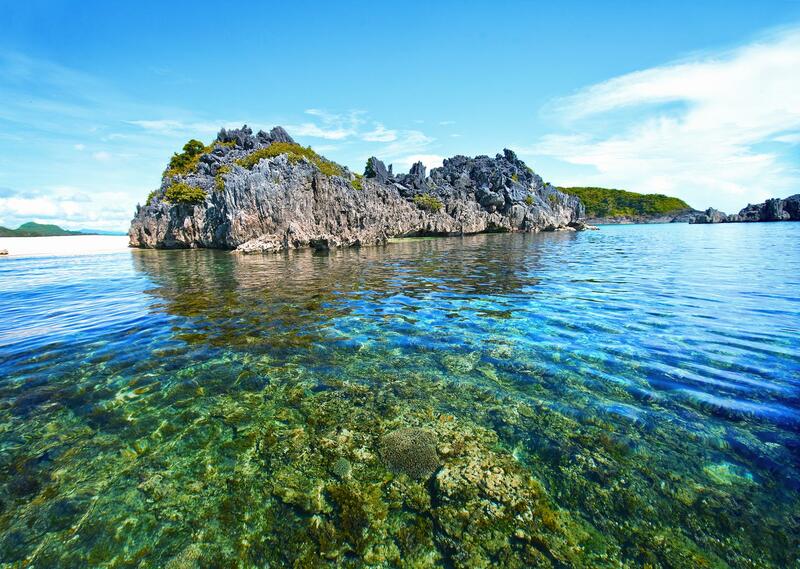 Matukad Island, for example, has a wall of jagged limestone deposits which braver tourists can opt to climb to be rewarded with a view of the neighboring scenery and the inner lake that is the home to one catfish whose relocation to the lake is perceived as a mystery. For a more normal thrill, tour the islets, unprepared to go snorkeling, and just buy a pair of wooden goggles from one of the roving boatmen. Ask your tour master to drop you off at the more popular snorkeling spots and enjoy the rich underwater life. 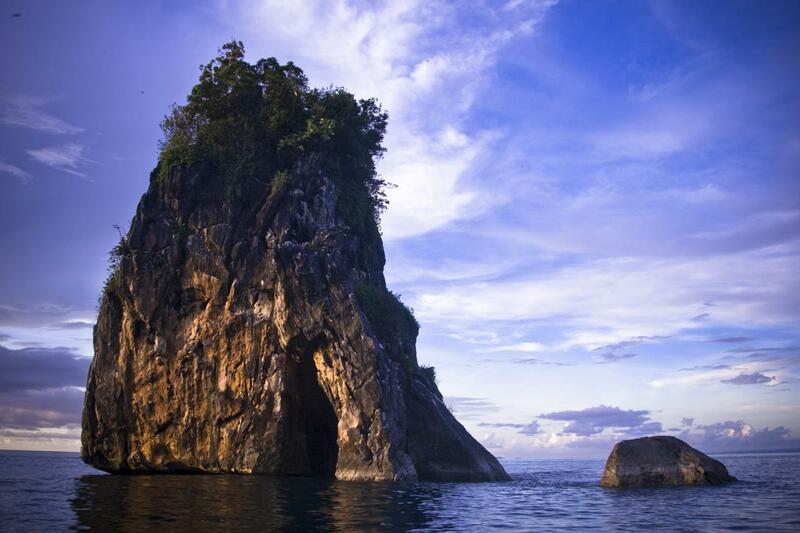 Other outdoors junkies would also enjoy squeezing through tight gaps and brave the inner workings of either Omang Cave, Manipis Cave, or Culapnitan Cave. Each offers a different adventure to the more able-bodied while all requiring the agility and flexibility to get through the narrow passages. At Omang Cave and Culapnitan Cave, tourists are treated to natural stalactite formations. On the other hand, Manipis Cave is a special attraction for treasure hunters who may want to try their luck at finding Yamashita ’s treasure. For other bits of culture in Caramoan, pay a visit to the redbrick St. Michael the Archangel Parish Church or take a side trip to Barangay Tabgon and see the Shrine of the Blessed Virgin Mary. 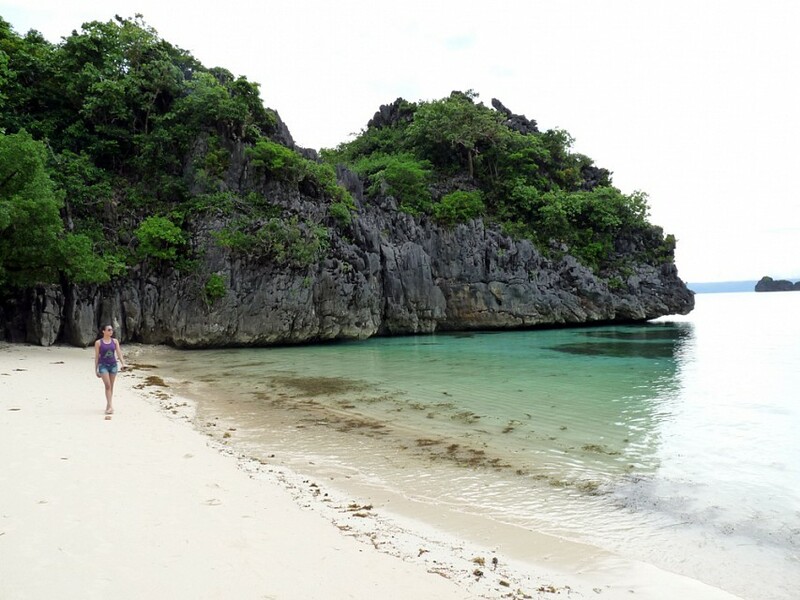 The easiest way to get accommodation in Caramoan is by booking a tour package. That package will also would include transfers between Naga and Caramoan, chartered boats for island hopping, meals for the whole stay and of course the rooms to sleep in. However, for those who wish to go the DIY route, there are also a number of hotels, inns, and lodges who warmly welcome walk-in guests. Some of the places to stay in when visiting Caramoan would be Gota Village and Tugawe Cove Resort for more luxury accommodation and CMC Villa Caramoan Hostel, The Central Discovery Hotel, and Rex Tourist Inn for more budget-friendly options. 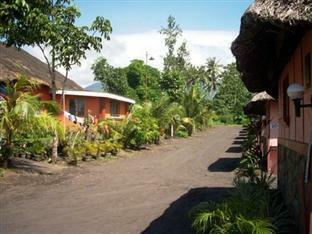 Gota Village is a very pretty location with standalone cabanas offering couples and groups privacy. Imagine it as a quaint little town with small, air-conditioned houses huddled in small groups and connected by narrow walkways. It is surrounded by lush greenery, and each home is well-lit offering weary travelers a comfortable respite. 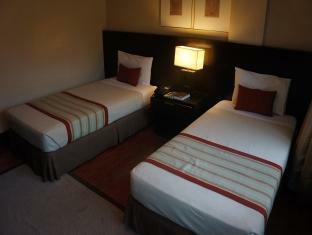 To get its most spacious cabana, budget ₱3,000 ($66) for a night’s accommodation. This can already house 3 persons max. 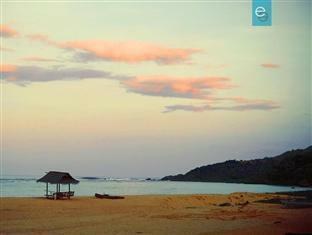 For an even more luxurious stay in Caramoan, check-in at Tugave Cove Resort. Rooms for 4 can cost as much as ₱9,000 ($198) including taxes and fees, while their rooms for 2 could go as high as ₱7,200 ($158). 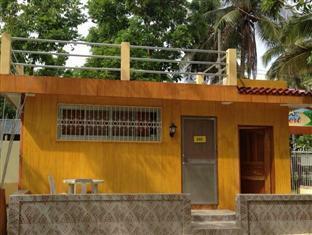 The distribution of the cabanas are almost like that of Gota Village’s but they are more decorated inside. These structures are also made of concrete and look more like small minimalist homes with huge glass sliding doors. Perhaps the clincher for such a high-end place would be their infinity pool and the more picturesque surroundings of the cabanas. In a less glamorous setting, you could opt for cheaper Central Discovery Hotel which just looks like a smartly-divided modern country home and is visually-appealing nonetheless. Its most expensive room would set you back ₱2,500 ($55) and could already accommodate 8 - 9 people if you request an extra mattress that would cost you ₱500 ($11) to rent. 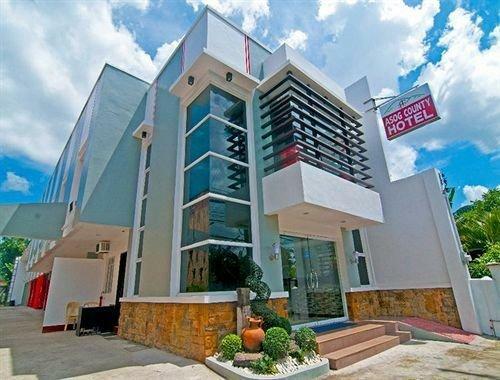 Finally, for the most budget-feel digs, you could check out either CMC Villa Caramoan Hostel or Rex Tourist Inn. It might be a tight squeeze in CMC Villa Carmoan, but at least the larger rooms can accommodate over 16 people and the 2,200 quote PHP for a 2 days/1 night stay is already a packaged offer. 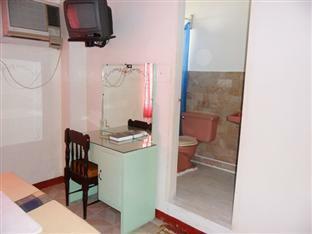 On the other hand, Rex Tourist Inn might not be at the prettiest location but fan rooms cost as cheap as ₱300 ($6.60). If you want to live the backpacker life on a backpacker’s budget, then this might appeal to you. Since most people go to Caramoan to enjoy the islets, it can be expected that there isn’t much happening in the municipality proper itself. Your best luck would be eating at the places where you’re staying. They’ll serve you typical Filipino dishes and you’ll like them because you can really taste the fresh ingredients. However, what you shouldn't miss trying would be the famous Bikolan dishes called Bicol Express and Laing. The former is a dish made with minced pork, shrimp paste, coconut milk and a whole lot of chilli peppers while the latter is taro leaves also with coconut milk and chilli peppers. These people obviously love their chilli! To get to Caramoan, you could either fly or drive the long way to Naga and then ride again to the municipality itself. To get to the islands, chartered boats can take you around. A flight to Naga from Manila should take about an hour and a bus ride to Naga from Manila will be about 9 - 10 hours. For now, only Cebu Pacific and Philippine Airlines have flights to Naga. Reputable bus lines to the area are serviced by Peñafrancia Tours, RSL Bus, and Isarog Bus. From there, you could either take a ferry boat from Sabang Port and head for Caramoan within an hour and a half or you can travel by land and get there in 4 hours. By land, your best option is to get this with a tour package so that you won’t have to think of how you’re getting in and out of Caramoan. 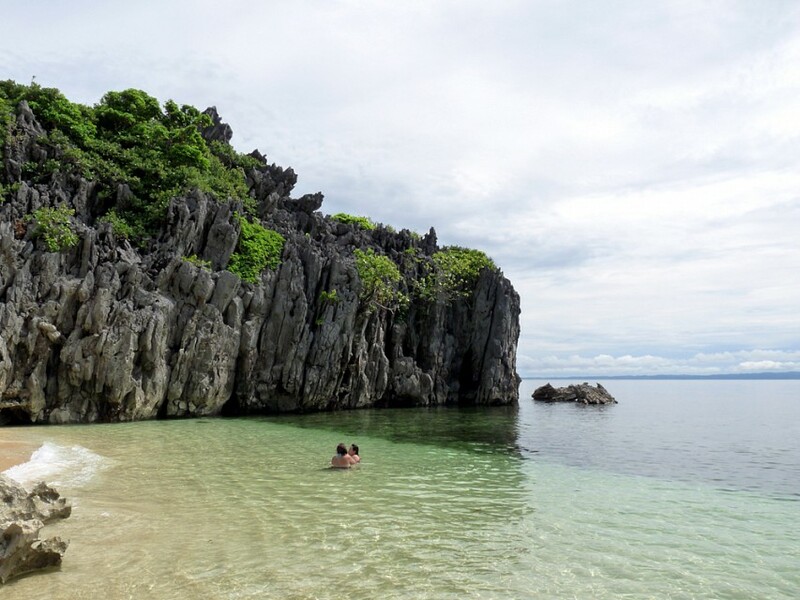 Caramoan is a safe municipality as much as crime rates are concerned. What tourists have to watch out for would be typhoon season, which happens between May and November. At the worst times, roofs will be flying and the water will be very rough. On the dry months, however, Caramoan is as pleasant as paradise.